Musical is one of the most exciting genre in cinema where the actors can showcase all their abilities and skills to entertain us. Singing, dancing, jumping up and down, even making strange and funny facial expressions are not easy at all. And if you think otherwise, you should certainly try to do it yourself… The year 1952’s Singin in the Rain is one of those movies you can’t watch without being amazed, curios and fascinated. Because you know it does not matter how many La La Lands will be made now or in the future. Nobody can ever master what was perfected by Gene Kelly and Stanley Donen. Kathy Selden (Debbie Reynolds) dreams of becoming a movie star. But all of a sudden, a star falls right on her car, Don Lockwood, who was happy to escape undesired and boring event. They both fall for each other immediately, which creates lots of hilarious and unforgettable moments for the viewer to enjoy. When Don and superbly talented Cosmo Brown (Donald O`Connor) face the disastrous premier of their first sound movie, thanks to Lina’s awful performance, the trip, Kathy/Don/Cosmo decides to turn it into a musical where Kathy will dub Lina’s voice. From that moment on, the ridiculously funny scenes or dialogues will make you feel as you are on the journey to the world of full of laughter where you always get younger and happier every second you spend in it. 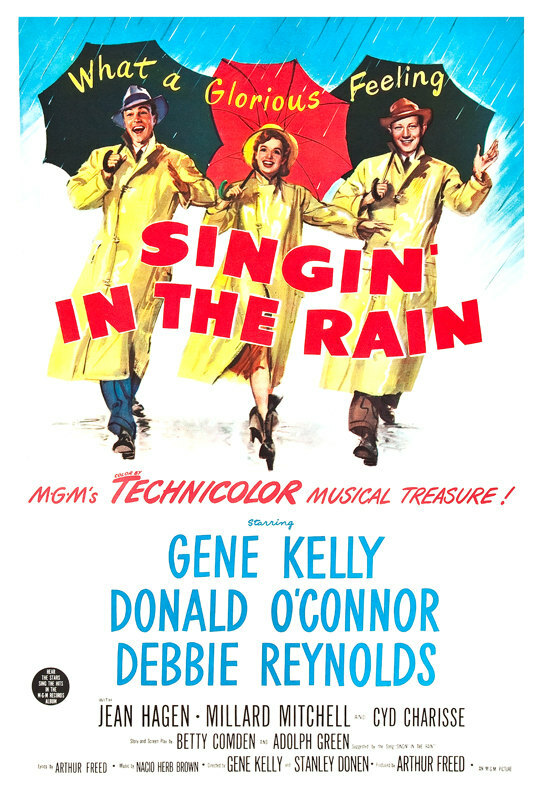 My favorite part of Singin in the Rain is when Gene Kelly, Debbie Reynolds and Donald O’Connor dance while they sing Good Morning. It’s fascinating to see their ability of feeling their body and make it so weightless. As you watch them, you simply can’t stop admiring their dancing abilities. Of course, some people are born with the talent, and the lead cast were one of them. But the credit must go to funny and charming Jean Hagen whose Lina steals every scene she in. Her low voice, and the way delivers the line is unique and adorably infectious and viral. In conclusion, Singin in the Rain will make you feel bad for the current movies. It will also make you wish to own a time-machine to travel back in time when the viewers were highly regarded by the Film Production studios and the quality of the film was the priority. Yes, after you watch a piece of art, you will ask yourself why there are no such movies anymore? Why we don’t have a movie like Singin in the Rain made nowadays to watch all over again? But if you allow me to answer such a question, I would say the following; there are no filmmakers or actors left such as Gene Kelly, Debbie Reynolds, Jean Hagen and Donald O’Connor. We no longer have produces left that would seek for perfection. We no longer have screenwriters left who would follow the old styles of writing a screenplay, where the intelligent language was used to make us laugh. But that’s alright. As long as we have movies like Singin in the Rain, we have hope and the reason to have another excellent movie night. Because this movie delivers more than you can even imagine. It’s a bundle of joy you would like to carry with you for the rest of your life.